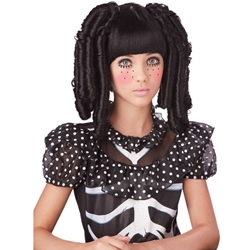 The Baby Doll Wig is a Black wig with curls and bangs which comes in a child size standard. The Baby Doll Wig is perfect for a Doll or Schoolgirl costumes – customize your look to be either cute, or creepy. Great for Halloween, or dress up any time of the year!